Dr. Abbey J. Lee can help treat minor dental misalignment with Six Month Smiles® clear braces for adult patients looking for a quick and discreet alternative to traditional metal braces. This effective orthodontic treatment at Smiles 4 Grant Park in Atlanta, GA uses clear brackets and tooth-colored wires to inconspicuously straighten teeth with a low force approach. 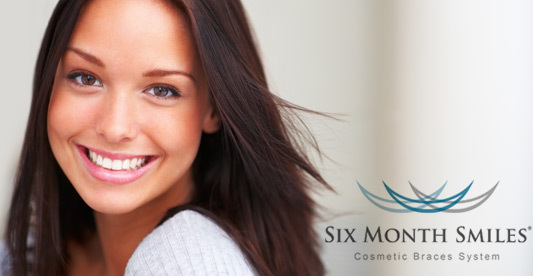 Six Month® Smiles uses the best aspects of traditional braces, enhanced with clear and comfortable materials to deliver quick results in six to nine months. In most cases, this cosmetic dentistry treatment can deliver faster results than Invisalign® aligner trays and is often chosen as a more affordable approach to achieving a straighter smile. Dr. Lee will perform an evaluation of your teeth, gums, and jawbone to determine if Six Month Smiles® is right for you. To qualify for this orthodontic treatment, it is recommended that patients be at least 15 years old with fully developed primary teeth. The best candidates for this procedure include patients with good oral health who are struggling with minor dental misalignment, such as slightly gapped, overcrowded, or crooked teeth. Patients with more significant dental misalignment and complex bite issues would benefit more from traditional metal braces or Invisalign®. Once candidacy has been determined, Dr. Lee will create a personalized treatment plan and take impressions of your teeth for the Six Month Smiles® lab to use in designing your braces. In about two weeks, once the braces have been crafted, she will attach the brackets to the front surface of your teeth with a gentle, yet durable adhesive, connect the brackets with tooth-colored arch wires, and use clear ligature elastics to hold the wires in place. Each month you will visit Dr. Lee so she can make any necessary adjustments and confirm your teeth are responding well to treatment. This orthodontic treatment uses low force techniques to gently shift teeth into proper position. Because it focuses primarily on the aesthetics of your teeth rather than shifting your bite to realign teeth, treatment is quicker and more comfortable than traditional braces. If you are self-conscious about the appearance of your smile due to crooked or gapped teeth, you may enjoy the benefits of clear braces. With the latest advancements in orthodontics, patients of all ages can achieve the smile of their dreams without exhausting their savings or wearing unattractive braces for years. You can schedule your consultation today by contacting Smiles 4 Grant Park online or calling 404.328.7177 to learn more about Six Month Smiles®.